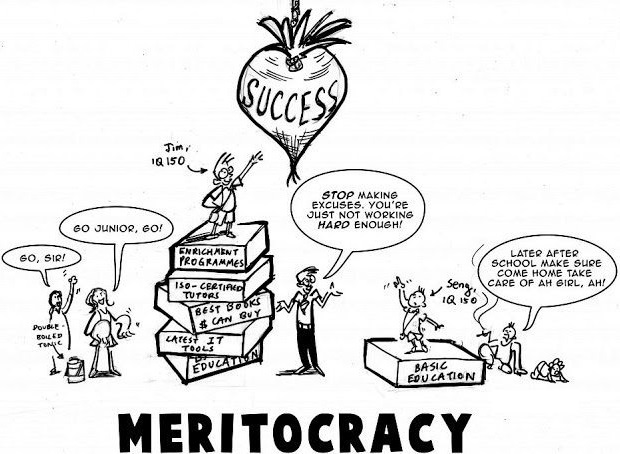 No other country's leaders use the "meritocracy" narrative like Singapore's do. We hear them say Singapore is a meritocratic society so very often..... as if others aren't. Meritocracy is dangled as the main justification for their high salaries and those of their fellow elites - by implication poor Singaporeans remain poor for life because they deserve poverty. And this "meritocratic" thinking is invested deeply in policy-making, always enriching the top yet doing too little for folks stuck on the bottom rungs. According to visionary billionaire businessman Warren Buffett the economic system cannot be depended on to allocate wages fairly, if anything it only amplifies the disparity of affairs. In fact the subsistence of high income inequality tells us wealth distribution is exceptionally skewed; a privileged few are getting much more than they deserve while many others are not compensated with the bare minimum. Instead of a purely meritocratic system we should strive for the best social outcomes with policies enacted to sufficiently tackle wealth inequality. If one remains unconvinced much change is needed, then look no further than the Oxfam report that ranked Singapore in the bottom 10 as far as efforts to tackle inequality are concerned. The Singapore government as a consequence of its ideological thinking views outcomes being premised upon meritocracy, and therefore things turn out the way they should be. Warren Buffett on the other hand warns us never to measure success by virtue of the enormity of material gains, and to abstain from using meritocracy as the sole means to make the attainment of these gains appear reasonable. What Singapore badly needs is a paradigm shift in governmental perspective so that we can begin our slow ascent from featuring among the worst on Oxfam's Commitment to Reducing Inequality Index. Beyond the obvious humiliation, there is an urgent need to recalibrate perspectives and expectations; Singapore cannot afford to continue down the present path and fail its citizens even further. I hope the upcoming 4G leadership in Singapore will be brave enough to trash prevailing irrelevant mindsets and steer us out of the shadows. Do what's right, not what's fashionable.